My early introduction to cars as seen in the previous article My early introduction to racing cars had and still has an influence on me. 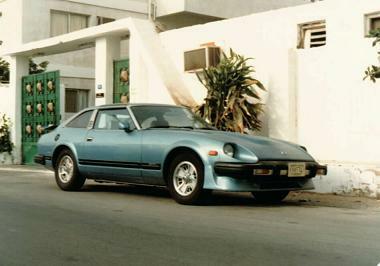 In Saudi Arabia I had a Nissan 280ZX sports car, not very good for carrying diving equipment and driving in the desert. I replaced that car with a Toyota Celica. Still a little sporty, but I could just about travel in the desert with it. My Nissan 280ZX in Saudi Arabia. It was my intention, my dream whilst working in Saudi Arabia to own a Mazda RX7. I wanted to drive the car from Jeddah, all the way back to the UK. That was not to happen. 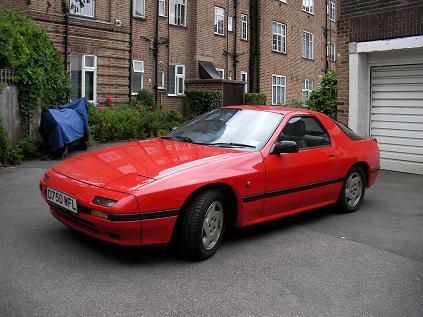 But, syncronicity, the first garage I went to on my return to the UK looking for a car after years of working in the Middle East, was a Mazda dealer, and they were selling their managing directors wifes RX7 car, she had owned for six months and hardly ever used. The car is still mine, all mine. I have not used it, and it has not moved for nearly five years, as I have a Mercedes to carry all my sound equipment about in, but today I got the RX7 back on the road, taken it to a local garage for a full service, in the hope that I can drive it once again. Mazda introduced the RX7 in 1978, although my car was first registered in 1988. It has a twin rotor rotary engine, also known as a Wankel rotary which it had licensed from NSU-Wankel, rather than having the conventional piston engine. Very few RX7‘s, styled on the Porsche 944 but looking more like the Porsche 928, were produced, and have since been replaced by the RX8, still with the rotary engine.